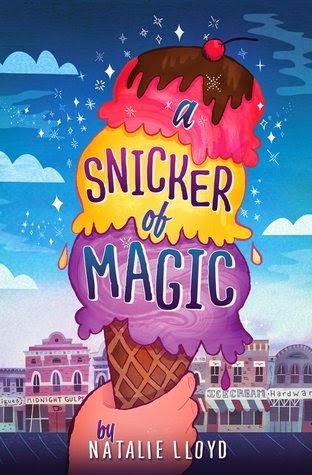 A Snicker of Magic by Natalie Lloyd is available at Amazon, AbeBooks, BooksAMillion, and Barnes and Noble. This book is adorable. I love how it introduces vocabulary - this book is perfect for parents who like to read with their kids and want some extracurricular activities like looking up definitions or using the word-lists found in this book for kids to make their own poems. It's also a handy way to introduce kids to the concept of neology - that word is never mentioned in the book but the main character, Felicity Pickle, is a neologist who invents words like spindiddly, which means "better than awesome." I love language evolution so this appealed to me greatly. The first couple of chapters made me anxious because of the use of the word gypsy. My family has Romanichal roots and the way Travelers are portrayed isn't always pleasant. The Romanichal and Roma are never mentioned by name in this story, only the word gypsy is used and not in context with Romany culture. The Pickle family is what the Roma call New Agers/New Age Travelers - people who live a Bohemian lifestyle without following Romany culture. I would like to caveat the previous sentence by pointing out that there were a couple paragraphs that made me imagine that the town of Midnight Gulch may have originally been settled by the Roma who then forgot who they were (which is a reality for many American Roma families). New Agers can be a source of despair for the Roma - imagine what you think you know about gypsies and there's a good chance you're envisioning New Age Travelers instead of actual Romany people, but the Pickle family doesn't even rely on that stereotype which is a nice change from the usual portrayal. I'm so pleased that I received a free copy of this book from GoodReads First Reads in exchange for a review because I loved this story. The writing style made me think Dr. Seuss meets Roald Dahl meets Alice Hoffman. I look forward to reading more work by this author.